This may not be a simple question after all. But, really, you should have a plan for when you study the Bible. So, maybe the question is simple, but the answer might not be. In fact, there is no exact answer that I am searching for here. I am not asking an objective question like “How do you study the Bible?” (Emphasis on “do”). I am asking a subjective question, “How do you study the Bible?” (Emphasis on “you”). That should make the answer to my question vary from person to person! Yet, there are still a few basics that most people should stick to as they study God’s Word. Here are a few that I can come up with this morning. The “when” of studying the Bible is always going to be different for each person. One person may have a busy 10 hour day of work that only allows them a few openings in the day to read. So, they might choose to read early in the morning before work, during a coffee break or lunch, or when they finally get home. Another person may have a rather flexible day, which might allow them to set a specific time each day that they will study their Bible or if they are not so organized they may choose a random time each day. For me, mornings work best. My wife and I are working our way through D.A. Carson’s two-volume devotional series For the Love of God each morning. Both volumes have a Bible reading plan (based on the M’Cheyne Bible reading plan) that will in the course of a year guide the reader through the New Testament once (if just using one volume of the devotional) or twice (if both volumes are used), through the Psalms once or twice depending on if you use both volumes or not, and through the Old Testament once in a year. My wife and I have elected to go through each volume in a year. Last year, we made it through volume one. When we started reading it was almost mid-summer, but we were able to start in Joshua and end the year with 2 Chronicles and in the New Testament we started in Acts and made it through Revelation. This year we picked up in Ezra and again in Acts, but I am sure we will get to the Gospels by the end of the year. This has been a great opportunity for my wife and me to start our days off “right”. Before we go to work we make sure we are fed with the Word and Carson’s devotional each morning provides interesting conversation starters! I highly recommend it to you! The “where” of studying will also be different for each person. Some can only study in the darkest recesses of their home while others can study the Word whilst a party of elephants dances around them! Depending on what you do when you study you may prefer a more quiet and calm setting over the distractions that come around too much noise. Either way, there really isn’t a wrong place to study. For me, I study with my wife at the breakfast table or on the couch before work. When I study alone, I am usually in my office with the door closed and there has to be silence for me to read! What tools do you use to study? Again, this varies for everybody. Some love to highlight their Bibles while others are afraid they might call forth God’s lightning should they touch sacred Scripture in such a way. Some use a notebook to jot down interesting thoughts while others might write in the margins of their Bible. Some carry around heavy commentaries to look for additional thoughts on confusing passages while others avoid commentaries like the plague. 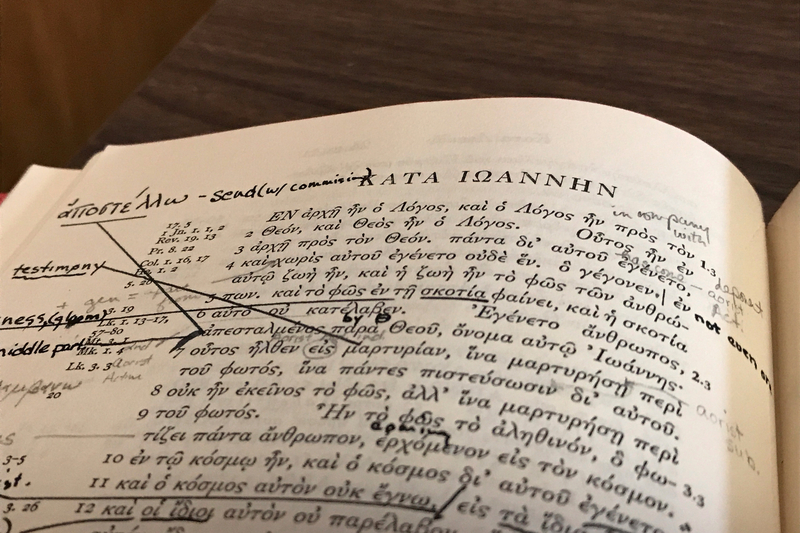 If one has studied the original biblical languages (Hebrew and Greek) they might choose to read the passage first in the original language before relying on the English. Perhaps some will even use two or three English translations to understand the text better if time allows. Again, the list could go on and on with the number of tools available today. For me, I like to read my ESV first (not the Study Bible), then I try to make as many observations as I can and then move to interpreting the passage through analytical questions. I also love to us Logos Bible Software, which although cost me a pretty penny, has a bounty of additional tools for me to use in my study. I am sure there are other tools I use, but these are at the foundation. So, how do you study the Bible? I could list more basics to Bible study, but I think these three get to the root of study Scripture in a productive way. Feel free to list some of your “basics” when you study the Bible. Perhaps it will trigger my mind to think of more later! You’ve chosen my favorite subject. Most of my study is done in the early morning before anyone gets up. It begins with the prayer to hear God’s voice and a heart to obey what He teaches me. I use the KJV and NASB and sometimes modern versions for some clarification. The Heb/Greek Key Study Bible, Vines Exp. Dict., Thompson Chain, and Bible encyclopedia are my main tools. I study using the Precept method of observation, interpretation and application, which means I mark a lot in my bible. The Lord has been teaching me lately to truly meditate on His word as I study. There is nothing quite like hearing His voice through the written word. Thanks for the opportunity to share. Mine is usually in the morning, and I am trying to start incorporating reading in Hebrew with my regular study time – even though I’m not through the grammar and my reading is incredibly, painfully slow! I also use E-Sword for word studies and as a quick look-up. My favorite lately has been the Complete Jewish Bible by David Stern, though I use it and the ESV pretty equally. I just read through the CJB translation of the Gospels and am starting again in Genesis. Also exploring the YouVersion app feature that allows you to invite others to read a plan along with you and provides a “Talk It Over” section for groups. I have a teen I meet with regularly and am hoping this will get her consistently into the word. Other than that, I tend to scribble notes in the margin, underline with colored pencils (I have a notecard for what each color signifies), sometime journal or blog, meditate on the Word, and sometimes jot certain Scripturees on note cards which I carry with me. Lately, I have been amazed at how often God will speak to me through His word and then turn around and use it to encourage someone else. Oh, how I would love to spend my life just learning more and more about Him!! Seems like an intense study! Thankfully, God has given us the amount of time we need in each of our lives to study his Word! Sounds like the perfect place to study! Wish I had my own place like that other than my church office!